Water Garden Construction & Design Company. Water Scenes are aquatic landscape specialist with over 15 years practical experience designing and constructing fish ponds in many different styles and sizes. We are well known for producing individual garden water features and often include bespoke water features in our ornamental fish pond designs. Popular choices include natural stone waterfalls & fountain features. Our company has extensive knowledge in the areas of water quality, filtration and fish health. We skillfully incorporate this with our wide range of pond construction techniques to produce ponds that look good and provide the optimum aquatic environment for fish to survive and thrive in all year round. Fish ponds and especially koi ponds require large amounts biological filtration to achieve a successful aquatic environment. We design our fish ponds to comply with an industry recognized fish water quality standard required by the ornamental fish industry professional body OATA. Also commonly known as a water garden, goldfish pond, koi pond or even wildlife pond an ornamental fish pond can be built to accommodate any size area or landscape. Water Scenes successfully design aquatic features for the purpose of keeping koi fish or goldfish and plants. There are two main considerations to observe when contemplating a fish pond feature. The most important factor is the pond size itself. Water Scenes recommend a minimum depth of 18 inches or 47cm for normal size fish and 2ft6inch’s or 75cm for koi fish and other large fish varieties. Please note that these are minimum depths and we recommend that pond exceed these measurements if possible. The recommended length and width will depend on the type and amount of fish you ideally require. The second most important requirement to consider is the fish pond filtration. Pond filters provide fish with the right environment to happily survive. 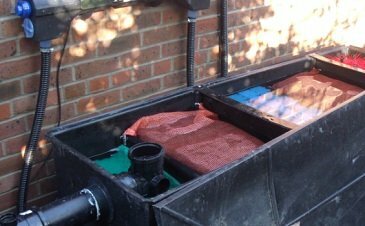 When designed or used correctly a fish pond filter system will maintain adequate aeration, good bacterial water quality both integral to a successful koi or fish pond keeping. All WS designs include a clear water guarantee as standard. When it comes to fish keeping we don’t believe in cutting corners and use our vast knowledge of pumps, UV’s and filters to ensure an aquatic environment in which your fish will thrive. Water Scenes use and supply an extensive range of cutting edge and traditional fish pond equipment not commonly available to landscapers or builders. We tailor each piece of equipment to suit your budget and fish’s health requirements. We skillfully balance the beauty of water gardens with the latest technology in fish keeping, providing you with a pond that not only looks great but also works efficiently without the presence of unsightly boxes and pipes. Taking pride in every step of water garden construction is what makes our ponds unique and your fish happy. 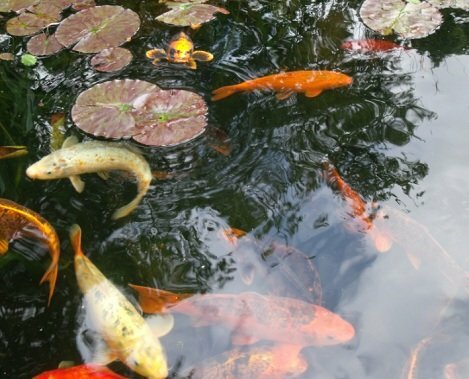 We install koi and fish ponds to a very high standard and have a comprehensive list of criteria which we follow rigorously, thus ensuring your satisfaction. Using the best materials available in construction, we apply our tried and tested techniques allowing us to provide you with a pond that is not only aesthetically pleasing, but also sturdy and long lasting. We fit filtration to exiting features. If you have a pond that is in need of some serious attention then please check out our pond restoration and pond re-design page HERE. We have worked on 100’s of fish ponds and wildlife habitats. Why not call us and make an appointment today. It’s FREE to call and there are no obligations to commit.